"You won’t get a balanced bikini body by under eating and being a cardio bunny..."
Truth: You won’t get a balanced bikini body by under eating and spending countless hours on the treadmill. Contrary to popular belief, lifting weights will not give you a “manly” physique. As a professional in the fitness industry, I have heard many women say they are afraid of resistance training because they don’t want to lose their femininity and have a “bulky” shape. This is why I enjoy sharing my personal fitness journey because, well…seeing is believing and the proof is in the results. I am going to share with you my split training schedule, a complete workout schedule with exercises, reps, and sets formatted specifically for a competitive bikini body while also focusing on the importance of balanced training. *Cardio will depend on your individual goals. Currently I only do cardio 5 days a week for 20- 25 minutes. My cardio consists of HIIT training, stairs, elliptical, or outdoor runs. Looking at the schedule you will see each muscle group is touched throughout the week. Each workout starts with activation exercises to help warm up and activate the muscle. I choose movements that hit each part of the muscle evenly (ex: Shoulders = anterior deltoid, medial deltoid, and rear deltoid; each movement chosen will hit each head of the shoulder). Should you train the same body part several times per week? You may have noticed that Glutes and Abs are touched on multiple times. I do this because those are areas where I retain most of my body fat. I recently added abs back into my training, but I make sure to only do body weight exercises. This helps me avoid thickening the muscle fibers in my abdominals and having a “square” shape. One of the main features that judges look for while on stage is the illusion of an “hourglass” figure. When training glutes, I have different focuses for each day. I have seen the most results when I train glutes three days a week. 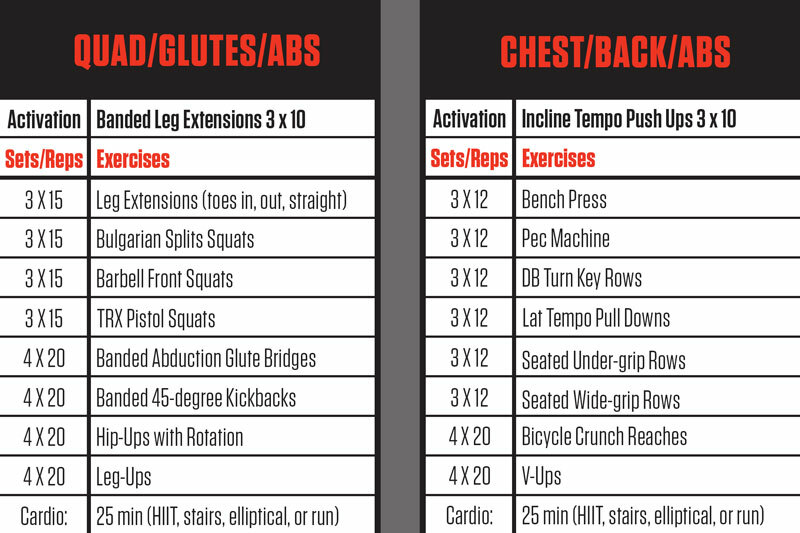 The first glute training day is endurance focused, 12 – 20 reps, using only my body’s weight and bands. This type of training, when combined with shorter rest times between sets, helps to build muscular stamina. I typically do 4 to 5 sets of each exercise and rest 20-45 seconds in between sets. The second glute training day is all about hypertrophy. I do 8 – 12 reps for 4 sets, moderate weight, and my rest time is about 1 – 2 minutes. This helps build muscle. The third and final glute training day is focused on strength. This consists of 1 – 8 reps for 5 sets and I rest for 2.5 – 3.5 minutes in between sets. This will aid in building overall strength. Activation and form is key to muscle growth. Quads, hamstrings, and calves are broken up on different days, so I can really focus on activating those areas separately. When I trained these muscle groups on the same day in the past, I noticed my quads would take over during the movement and it was harder for me to activate my hamstrings. This resulted in slower development of my hamstrings and calves and over development of my quads. My past programs also usually consisted of 10 – 12 movements and my lifts would last over 2 hours. This compromised my form. I believe in quality of the movements over quantity of sets or reps. I have seen significant improvements in my physique since changing the style and split of my workouts. I am able to spend less time focusing on additional movements and spend more time focusing on form and activation of the muscle; form over everything is key! Unfortunately, chest is an area many females neglect. Why is it important for females to train chest? Let me first ask you; how strong are you at push-ups? Many women struggle with push-ups and often times it is due to weak chest muscles. Training chest will not only contribute to overall upper body strength, but it will also help aesthetically. Have stubborn “armpit fat”? Want fuller shoulders? Working chest engages the anterior deltoid (and that arm pit area) which can help fill out your shoulder caps. Throwing a couple chest exercises in your workout can also help engage and build a better back. After a few chest activation exercises and knocking out 2 chest movements, I head straight into my back movements. I include push and pull movements, while focusing on various hand positioning. Having my palms up allows me to target my lower lats. Narrow and wide grips can also target different areas of your back. If you have a goal of being able to do a pull- up unassisted, make sure you are incorporating back into your weekly split. Building your back will also create the illusion of a smaller waist. On my Shoulders, Biceps, and Triceps day, I like to superset everything and really focus on hypertrophy training. I am not focused so much on strength for these areas, I want muscle definition. As I mentioned earlier, I make sure to hit each head of my shoulder. When I first started bodybuilding, I hit shoulders twice a week (I did one less glute day, so I could hit shoulders more) because my physique needed bigger shoulders to be competitive in the bikini division. Once I developed enough muscle in my shoulders, I dropped it back to just once a week. Another important component of my training calendar is the full rest day. In this program, Day 1 is a lower body focus and Day 2 is focused on upper body. Those areas need time to recover, which is why Day 3 is focused on cardio and contains no weight training. Day 5 goes back to upper body, giving my lower half even more time to recover so that by Day 6 I am ready to go. Day 7 is a complete rest day, no cardio, and no resistance training. Give your body the rest it needs! Recovery is a crucial aspect of training that is often neglected and results inevitably in injury. I highly recommend taking extra care of your body, so you can continue making progress towards your goals. Recovery includes but is not limited to: stretching, foam rolling, tissue work, ice/heat therapy, proper sleep and appropriate supplementation. It’s important to remember that there is no quick fix. Real results require real time. 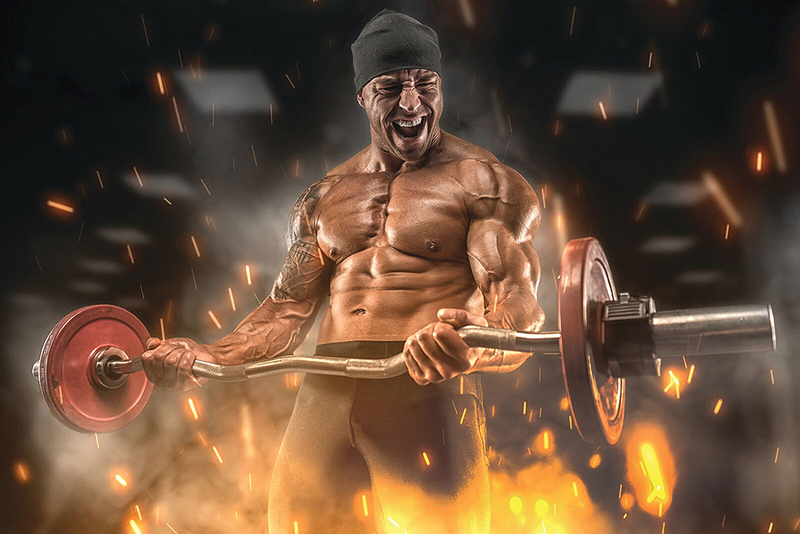 Rushing your transformation by turning to crash diets, PEDs, or joining team “no days off” will likely result in over training, injury, and yo-yo-ing that will only prolong your ability to reach your fitness goals in the long run. Commit to living a healthy lifestyle, rest when needed, and give your body the time it needs to build a balanced bikini body. This workout split serves as an example on how to hit each muscle group to help you achieve a balanced bikini body. Your split may be a little different depending on your goals and current physique. You might not need to hit glutes three times a week but instead, another muscle group that needs more attention. The main take away is that you shouldn’t just train for aesthetics, nor should you avoid resistance training and head straight for the cardio machines. Train for longevity; train for functionality. You will achieve much better results and be rocking that bikini body before you know it! Click here to download this workout. *Editor’s Note: You can find Breena at @breenamartinez on Instagram or through her website www.breenamartinez.com.